Ok, here we go. It’s time for the Big Run. 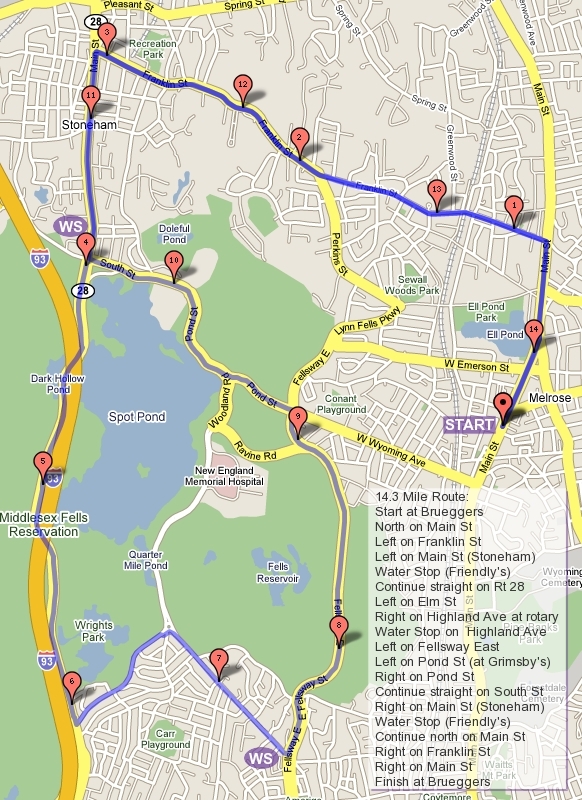 For those training for Baystate its your 22 miler. For those running the associated half marathon, its time for 11 miles. These distances sound overwhelming, but don’t let them be. Any job seems overwhelming when you look at it as a whole, but chop this down into its components, water stop to water stop, and you’ll find that ita just one more water stop than what you’ve done in the past. Remember to test out race day as much as you can, clothes, food, rest, as well as running… but don’t race this one. You’ll find, like most long distance runners, that its hard to fight back the urge to run this run just like its your marathon. You’ll also learn that this may just be your best run of the season if you race it. For this run get the feel for the miles, but don’t try to set your PR. Hold back a little. Keep the great run for a few weeks from now. Ok, the route. Its very similar to the 2o miler but kind of in reverse, so no big surprises. Start out Main Street up past Ell Pond, tap Clarence for good luck, and then turn onto Melrose Street, then left on to LynnFells Parkway. As you pass the high school give a thought to Greg Moss, a young Melrose High School English teacher, and a supporter of Melrose Track and Field, who died unexpectedly earlier this week. Continue along the LynnFells past Grimsby’s onto the Fellsway East. Take those hills and ride them down to the rotary where you turn right onto Highland Ave. You’ll find a water stop along Highland. Turn left onto Elm and right onto Main Street towards Stoneham along the back side of Spot Pond. If you’re running long, at Friendly’s take a left, and run up to a set of lights, turn left onto Marble, cross over I93 and look for the water stop at Eugene on your left. Running short, cut through the parking lot at Straw Point and continue circling Spot Pond until you get back to Highland where you’ll take you’re next water stop. Shorter route runners will finish up by turning left on East Border Road, left back on to the Fellsway East, turn right onto Ravine Road and right onto West Wyoming. When you get to Main Street turn left and finish at Brueggers. Longer runners, continue on Forest into Winchester, turn left onto Highland Ave past Winchester Hospital, all the way to the end where you’ll find water stop 3. Left on Main Street in Medford out to the right at Playstead Road, turn right onto High Street at the Dunkin Donuts, and follow that up to Mystic Valley Parkway. A right there will run you along the Mystic Lakes. You’ll turn right onto Bacon at the end, then a left back onto Mystic Valley Parkway to a water stop. From the stop you continue on to a left onto Washington Street. Follow Washington to the Gingerbread Construction Company where you turn right onto Forest Street. This will climb back up to the water stop at Eugene. Still going forward over I93, turn right on Park Street, straight past Friendly’s towards the Stone Zoo. After the zoo turn left onto Pond Street down to Grymsby’s. Turn left at Grymbsy’s on to the LynnFells Parkway. Up past Melrose High School to a right on Melrose Street, a right on Main Street one more tap on the Clarence DeMar monument as you finish your run at Brueggers. Water Stops. There will be a need for several helpers. There are 4 water stop locations needed continuously through the day. That’s me and three helpers. Any takers? Please? Ok, who’s running? Roll Call!!! This week’s run starts with a quick left turn up East Foster Street. Run up to the far end of the Melrose Common and turn right onto 6th Street. That will secretly turn into Swain’s Pond Ave and take you up into a wooded corner of Melrose, past Turners Pond and Swain’s Pond. The road will turn right at a stop sign, but remain Swain’s Pond Ave. You’ll eventually get to Lebanon Street, turn right there (every year someone tries to go left there. Don’t). Lebanon will take you to a set of lights where you’ll turn left onto Forest Street and run to the end of the street where, across Main Street, you’ll find a water stop in the parking lot of Citizen’s Bank. After that water stop you’ll head out of the other end of the parking lot onto Winter Street. Run past the Oak Grove T stop to an intersection. Straight across the intersection will be Glenwood Street. Run there. Glenwood will bring you up to the rotary at the Fellsway East. This is where you take a right on the Fellway East and follow it up past Grimsby’s onto the LynnFells Parkway. Keep going, up a hill, and down to Melrose High School where you’ll find water stop 2 at the knoll parking lot. By the way, if you’re running short, go right down West Wyoming and left onto Main Street to finish up your 11.1 mile run. After the high school water stop, keep running along the LynnFells into Saugus, where you’ll take a left into Breakheart at the Saugus entrance. Keep an eye out along the entrance road, there will be a water stop either in the lower parking lot by the hockey rink or the upper lot at the park headquarters. Next leg is a counterclockwise run around the outer loop of Breakheart.Go in on the right, come out on the left and find the water stop again. Head back out to LynnFells and go right to run the LynnFells Parkway back to Melrose High School. That water stop should be right where you left it. Finish up with a backwards run of the start of the MRC Summer route. Take the LynnFells over to Grimsby’s, take a left on West Wyoming and a left on Main Street. There you’ll find Brueggers and the end to your 18 mile run. Water Stops should be taken care of. All you need to do is show up knowing where you’re going. Study the map, memorize the turns, and have a great run! Who’s in? ROLL CALL!!! After the 22 Miler last week, long runners get a shorter, flatter (for most of it) route for their recovery run this week. For those training for a half, they also step back this week, from 10+ to 8. A well deserved relaxing week for all those that powered through their long runs last week. So this week we will be contending with the Victorian Fair in downtown Melrose. Typically I suggest getting out of dodge early. It gets us our of the way of the fair setup and back in time to help with the Victorian Fair road race. This week the Vic Fair lines up with a one water stop location route, so that’s not as necessary. So here’s how we’ll do it this year: Start Whenever You Want… no earlier than 7AM though. I’ll be at the water stop location at Nick’s Pizza by 7:30 and we’ll man it until about 11:00, so plan your route to use the water stop between those times. Here’s the route: Leave Brueggers and feel free to run down the middle of Main Street for a block or so towards Wakefield, the road is closed have fun with it… just get over to the sidewalk when you see traffic coming. Run Main Street all the way into Wakefield to Nick’s Pizza for water stop 1. After the water stop continue north towards Lake Quannapowitt. Training for a half, your route brings you up to the lake, but turn left onto Church Street, follow that to North Ave where you’ll turn left. North Ave will bring you back to the water stop. For those who have run a few half marathons, if you’re looking to improve at your half I suggest you stretch your distance and loop the lake. Nothing makes a half feel easier than stretching your long run training out to 15 miles or so instead of the 11 prescribed for new half marathoners. After your water stop head back Main Street to Brueggers. If you’re running long, don’t turn on Church Street, continue on Main Street along the right side of Lake Q. Loop the lake by turning left on Lowell Street, left into the Comverse parking lot, and left on North Ave. This week you’ll be following North Ave back to Nick’s Pizza for your water stop. From there you’ll follow Nahant across to Wakefield High School. Run up past the Voc into Breakheart. Run counterclockwise through Breakheart outer loop. Pop back out where you came in, past the Voc, past Wakefield HS, and across Nahant back to the water stop. If you get thirsty along the way there is a water fountain at Breakheart’s headquarters and I believe one by the tennis courts near the HS. After this visit to the water stop its nothing but Main Street to finish up your run at Brueggers. After a cup of joe and a bagel head over to the Victorian Fair and see how you can help Brian Slater out. Ok, Water Stops, I’ll be at Nick’s. Thuy will stop by and help out. Simple as that. Roll call. Let me know what you’re running and when you’re starting. I’ll probably stop in at Brueggers around 7 and I’ll see you out there as you pass through. Who’s in? Week 9 – Twenty Miler! As we head in to a long weekend, we also head in to the 20 milers for those aiming for the Baystate Marathon and a 10 miler for those gearing up for a half marathon. This is the week to test out your race day routine. Saturday plan to eat your pre-race meal to see how it feels in your belly on Sunday Morning, when you should be trying out your race morning breakfast. Check your running shoes, do you have just over a month’s worth of miles left on the pair you’ve trained in? If not, time to break in a new pair for your 22 miler, buy them now but don’t do the 20 miler in them since they aren’t broken in yet. If its a close call and you like the pair you’re in, start limiting this pair to just the long runs while your other runs are done in a new pair. If you timed things out well, wear your race shoes Sunday, as well as your race sox, shorts, shirt, and whatever else you carry on your body on marathon day. Its best to test out how they fit for hours of running today than to wait to marathon day to find out they have issues. This run is THE run to figure out your race day routine. The run starts out Main Street and right on West Wyoming Ave, past Grimsby’s and up to Spot Pond. Take a right at the pond, past Stone Zoo, past Friendly’s to a set of lights at Park Street and Marble Street in Stoneham. Take a left at the lights and run over I93 as Marble Street turns into Forest Street in Winchesters, to the first water stop at the corner of Eugene. After that water stop continue along Forest Street down to a left onto Highland Ave toward Winchester Hospital. Run past the hospital and continue along Highland all the way to the end. There will be a 5 way intersection to cross. Go straight across their to continue on Highland. When you get to the end there will be a water stop off to the right. Next up take a left on Main Street/Route 38. This will take you from Winchester into Medford. Cross over to the right side of the road and as you pass Oak Grove Cemetery turn right onto Playstead Road hugging the cemetery wall. Playstead will bring you to High Street/Route 60 in Medford. Turn right onto High Street, crossing the commuter rail tracks and a Dunkin Donuts (a convenient potty stop). You’ll find a fork in the road on High Street, keep to the left to stay on High Street. You’ll find a rotary before the Arlington line where you’ll turn right onto Mystic Valley Parkway. This will take you past the Mystic Lakes. Mystic Valley Parkway will come to what seems to be the end, turn right there onto Bacon Street, running under the commuter rail tracks, and take a left back on to the Mystic Valley Parkway where you’ll run to the third water stop. Leaving the stop you’ll continue on the Mystic Valley Parkway to Washington Street, where you’ll turn left. Washington will cross Mount Vernon Street at another 5-way intersection. You’ll want to cross Mount Vernon and stay to the right to keep on Washington Street, which after more than a mile will take you to Forest Street where you’ll find the Gingerbread Construction Company. Resist the urge for a muffin, and instead turn right on Forest and proceed up, up, up the road back to water stop 1 at Forest and Eugene. Head back into Stoneham onto Marble Street and turn right at the next set of lights back onto Park Street. When you get to the set of lights at Friendly’s turn right onto Main Street/Route 28. This will take you along the back side of Spot Pond, turn left on Elm Street and continue up to the rotary at Highland Ave and Woodland Road. Go right at the rotary onto Highland and find the final water stop after you round the corner. From there you’ll continue on Highland Ave to the rotary at the Fellsway East. Turn left there and run the hills of the Fellsway East until you reach Grimsby’s. Go right onto West Wyoming, then left onto Main Street and then get yourselves a bagel at Brueggers, you deserve one! The shorter route runners… You’ll head out the same route as the long runners up through the first water stop, out through Highland Ave until you hit Eaton Street on the right side of Highland. There will be a small park at the corner where you’ll turn right and head down to Washington Street. Turn right on Washington and head back to a set of lights at the corner of Washington and Forest Street, across from the Gingerbread Construction Company. A right there will loop you back up to the Water Stop at Eugene. From there you’ll return the way you came, Forest onto Marble, right on Park, straight past the Stone Zoo, left on Pond Street past Grimsby’s to West Wyoming Ave and left on Main and back to Brueggers. Water Stops: We’ll need four stops active throughout the morning. Three volunteers besides myself would be very helpful. The Eugene Street volunteer will need to attend to the stop from 8:20 through about 11:00. The Highland Ave stop will be used from about 8:45 through 9:45. The Mystic Valley Parkway stop will need a car there from about 9:30 through 11:00. The final water stop will need to service runners from about 10:30 through noon. We can pull this off with three helpers if the water stop 2 volunteer moves over to the last water stop. Who can help out? Drop a note here and I’ll follow up tomorrow. Ok, big run, long post, only one thing left: ROLL CALL! Who’s in?